A year later, there has been little progress in rebuilding Nepal. It has been one year since two great earthquakes hit Nepal on April 25 and May 12, 2015. Together, the earthquakes claimed the lives of more than 8,800 people, injured 22,000, and left millions homeless. One year has passed without any substantial progress in reconstruction and rehabilitation. The earthquake affected some 3 million people, including women and children. Many continue to live in misery due to the government’s failure to take prompt measures to pave the way for the construction of residential houses. The condition of children, the elderly, and pregnant women is particularly difficult. It is still unclear when the people affected by the earthquake will get the promised money from the government to rebuild their houses. The government has just begun the process of distributing 200,000 Nepali rupees ($1,900) to construct houses but the money has yet to reach the majority of affected people. Due to the lack of clear government policies on rebuilding the houses, even the people who can afford to rebuild have not started the process. Instead, some businesses and NGOs have constructed temporary houses for those left homeless by the earthquake. 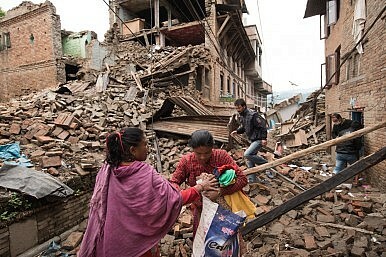 In a donor conference held in Kathmandu on June 25, 2015, foreign governments and donor agencies pledged to provide $4.1 billion for reconstruction after the earthquakes. This encouraged both the government and people, who hoped that reconstruction and rehabilitation process would gain momentum from international funds. Nepal’s political parties and government, however, failed to capitalize on the encouraging response of donor agencies during this initial phase. A lack of unity among political parties, dysfunctional bureaucratic structures, and resulting delays in arranging legal frameworks are the main reasons behind the near-zero progress in reconstruction and rehabilitation of earthquake damaged structures. The response from international donors in assisting the reconstruction efforts of the Nepalese government was very encouraging. Early on, this instilled hope among the affected people that they would receive help soon, but reality has set in. According to the newly formed National Reconstruction Authority (NRA), the central mechanism responsible for rebuilding after the earthquake, an estimated $6.7 billion is needed for the successful post-earthquake recovery and reconstruction in Nepal. That enormous sum will be managed by a shared modality among development partners, non-governmental organizations (NGOs), community-based organizations (CBOs), local communities, and the Nepalese government. Though donor agencies pledged large amounts of money, according to government agencies only 25 percent of the total commitments have actually been signed. Soon after donor conference, there was a dispute between the Nepalese government and donor agencies about how to channel the donations. Kathmandu took the position that money should be spent through a “one-door policy,” with all donations going to a central government fund before being dispersed. Donor agencies voiced their displeasure. Meanwhile, a long delay in the formation of NRA — it did not begin operations until January 2016 — also raised suspicions among donor agencies, who demanded the agency be established as soon as possible. However, there was no urgency on the part of political parties and the government to form a mechanism to carry out the task of reconstruction. The former government, led by Sushil Koirala, originally formed the National Reconstruction Authority in August 2015 through an ordinance in the absence of a parliamentary meeting. Koirala’s cabinet appointed Govinda Raj Pokharel, the vice chair of the National Planning Commission, as chief executive officer (CEO) of NRA on August 13. But less than a month later, on September 1, the NRA ordinance became naturally void as the cabinet failed to table the bill in parliament. Legislators demanded additional time to discuss the bill. The lengthy delay showed a lack of sincerity on the part of the various political parties to address the urgent needs of earthquake affected people. Later, the government assigned National Planning Commission the task of carrying out the post-earthquake reconstruction and relief work until the final formation of the NRA. However, these ad hoc provisions proved ineffective, as donors continued to demand the creation of the NRA as a condition for their support. After the promulgation of Nepal’s constitution in September last year, parties continued to squabble over forming a new government. In October, a new government was formed, under the leadership of the Communist Party of Nepal (Unified Marxist–Leninist) or CPN-UML, and the task of forming NRA took on new momentum. But it was delayed yet again due to disputes among the various political parties. Eight months after the devastating earthquake, on December 17, 2015, Nepal’s Parliament finally endorsed the Nepal Reconstruction Authority bill, paving way for the formation of NRA. On December 25, Nepal’s government appointed Sushil Gyawali, a civil engineer then serving as as the executive director of the Town Development Fund, as the CEO of the NRA, reviving hope that reconstruction would finally gain momentum. On January 17, 2016, in a symbolic gesture, President Bidhya Bhandari and Prime Minister K.P. Oli started the reconstruction campaign. As the country marks the first anniversary of the April 25 earthquake, the NRA still has yet to finalize the framework of reconstruction, including setting a time frame and organizing and distributing money. The NRA still has not defined the involvement of partners, which provides a foundation for kick-starting the work ahead. The unofficial economic embargo imposed by India soon after Nepal promulgated the new constitution also affected reconstruction and recovery, by causing an acute fuel shortage for several months. The government announced it will provide 200,000 Nepalese rupees to the earthquake victims to use in rebuilding their houses. Earlier, the government provided some assistance for building temporary shelters and buying warm clothes during the winter. But to the victims, the money seems like too little, too late. “The amount is insufficient to build houses, so we are in a dilemma over whether to build,” says Manoj Shrestha, an earthquake victim from Bhaktapur District. The government has promised to provide home loans with minimum interest rates; however, the process has not been started. People in rural areas have to go through a long bureaucratic process to secure loans, and many are not fully aware of how to fulfill the requirements. Meanwhile, the NRA is still struggling on the technical necessities—manpower and policy—required to start the reconstruction. And even if the NRA overcomes these hurdles, reconstruction faces the additional challenges of the lack of effective and accountable elected bodies at the grassroots level. The local bodies of Nepal face twin problems: the lack of sufficient government staff and the lack of elected representatives. And here again, political wrangling has delayed necessary work: some local governments refused to cooperate with the NRA unless various preconditions were fulfilled. Local governments, for example, demanded additional bonuses for their reconstruction work. There are also questions about the accountability and the proper use of resources as local bodies are not elected. To get around these issues, the NRA also plans to mobilize NGOs for the reconstruction work. However, this has already drawn criticism, as most of the NGOs are owned by people who are close to different political parties. Selecting a partner NGO thus raises questions of partiality. Beyond all these issues, the NRA and its local partners must also confront the question of corruption, a major concern for donor agencies. The Commission for Investigation of Abuse of Authority (CIAA), an anti-graft constitutional body, has already started investigation into allegations of corruption and misconduct against NRA CEO Sushil Gyewali. The CIAA has also found that, in the immediate aftermath of the quake, most local officials did not conduct proper investigations into the extent of the damage, but instead distributed relief funds based on personal connections. The NRA has been ordered to complete reconstruction within five years. However, this seems impossible if the current pace continues. The devastation is hard to overstate: 608,155 residential buildings were completely destroyed, with another 298,998 partially damaged. Furthermore, 2,687 government buildings (including schools and health clinics) were completely collapsed and 3,776 damaged. The lives of people in the 14 worst-affected districts are becoming difficult as they are compelled to live in temporary shelters. Many become sick due to the lack of proper food, water, and sanitation in these shelters. Prime Minister K.P. Oli himself has publicly admitted that it could take decades to complete reconstruction if the NRA continues at the current rate. Meanwhile, another, more pressing deadline is about to pass unmet. People affected by the earthquake have been demanding that they receive reconstruction money as soon as possible, so that they could rebuild their houses before the monsoon begins. That’s now just a few weeks away. Government officials are losing hope that people will able to build homes before the monsoon, meaning yet more misery for those devastated by the earthquake one year ago.